Friends v East Grinstead B.C. It was raining at home when we started out to go to East Grinstead, but it was dry when we arrived at the Club. We were warmly welcomed with ample tea and biscuits and the club members began to realise that we had come from different counties. Ten in all. The game was commenced in the dry, but sure enough it soon started to rain, although the real heavy stuff waited until after the match. The green was a pleasure to play on, even with a rabbit hole on one? (small scraping in the surface). Our members did us proud and we had a handsome win. We were given a beautifully presented salad and small cakes for tea. The captains, Mick Bushell for East Grinstead and Adie Lloyd for the Friends, thanked every-body and talked about the match. Adie then told them all a little about the Friends. Adie presented top rink prizes of his presidential pens – before they go even more out of date. 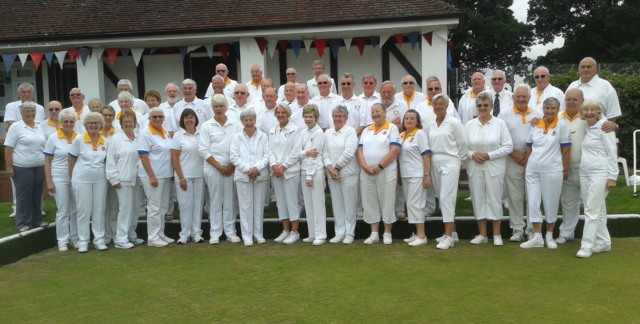 Their president, Bill Apps, gave a very interesting speech about the history of bowls in East Grinstead, their own club and a few well known people connected to the town. Next the raffle was drawn and then, a glass of celebratory wine was offered to us all. Thanks you East Grinstead for a friendly, very happy day celebrating your 80th Anniversary.